Disclosure: I received products from Mondelēz International, this is a sponsored post. Opinions are my own. In no time at all families will be gathering for the holidays. Thanksgiving is always a big hit in our home because our menu consists of tried and true recipes we have been sharing from generation to generation. From our famous Pepperoni Stuffing to the delicious Pink Stuff there is a lot of food we share with our family and friends. The trick to hosting a large Thanksgiving meal with little to no stress is to plan, prepare, and practice. Each year we plan the menu making sure to include everyone’s favorite dishes, but we also try to serve new things to spice it up a bit. Usually we add one new dessert and a new appetizer. On occasion we will incorporate a side dish, but for the most part I really try to make things that are relatively simple, quick, and delicious. Before the big feast arrives I spend a lot of time in the kitchen getting prepared. I chop, dice, and mince onion and garlic along with whatever fruits and vegetables I need. I store them in an airtight container so that when it comes down to throwing together the recipe all my ingredients are ready to go. For some of my casseroles I simply have them oven ready for the big day. I always make it a point to buy the freshest ingredients from Publix to ensure our dishes taste great. I never, ever serve a new dish for the holidays that I haven’t practice making at least two or three times during the year. 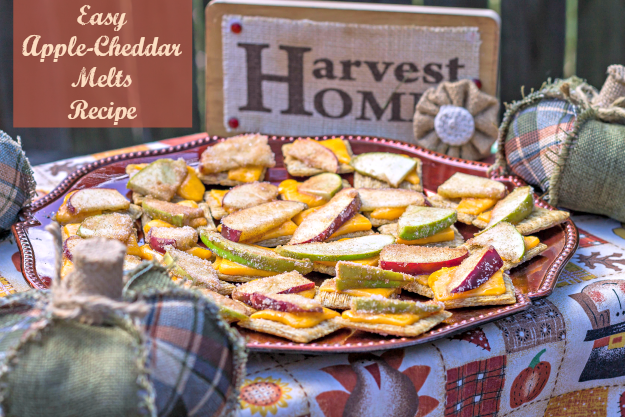 This year I’ve nearly perfected the Easy Apple-Cheddar Melts from The Ultimate Party Planner website. 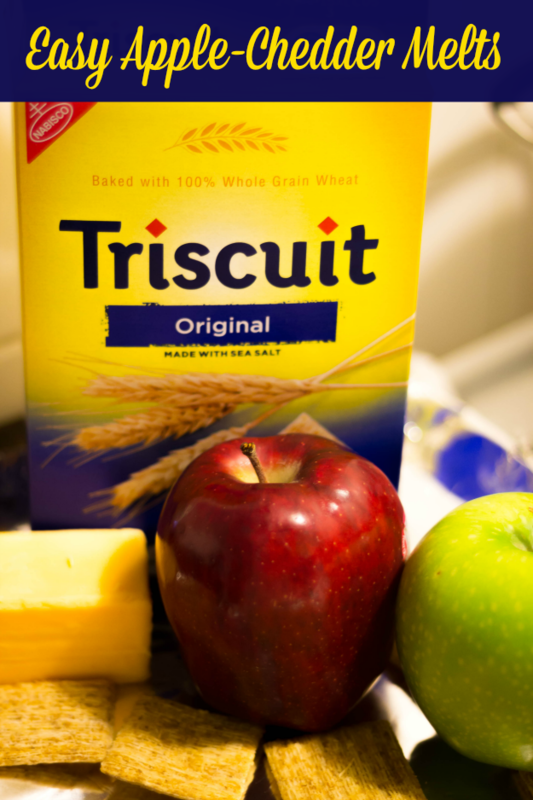 I love the juicy sweetness with the sharp cheddar and the Triscuit is the perfect cracker to serve it with so I’m excited to add it to our list this year. If you are looking for great ideas for the holiday’s this year be sure to visit The Ultimate Party Planner site. They have great recipe ideas that have been tested by mom’s like me. You’ll also find great coupons to help lighten your budget for some of your favorite brands (even the Triscuits for the recipe below). CUT cheese slices diagonally in half. Mix sugar and cinnamon in medium bowl. Add apples; toss to coat. PLACE crackers on baking sheet; top with cheese and apples. BAKE 4 to 5 min. or until cheese is melted. Serve warm. Find more recipes at The Ultimate Party Planner! Mmmm these look so tasty. Of course, we are huge Triscuit fans in my house, so pretty much anything on a Triscuit works for us! You are very smart to not try new recipes for Thanksgiving – that could be disastrous! This looks delicious!!! My kids would love this and I need an appetizer to take to Thanksgiving that the kids will like!! Now I have one! I know this would be a hit with everyone on Thanksgiving, including the kids. They look scrumptious. 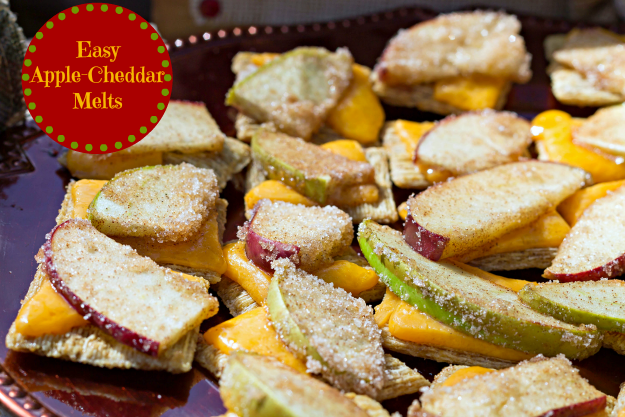 I would not choose to put apples with cheddar, but I know so many people that love that combo! Though I may not choose that combo, your appetizers look good!! Oh my word, these looks SCRUMPTIOUS!! Totally bookmarking this for later, thank you! Those look yummy and so simple, my kind of appetizer. I like that it is not a dish that needs a lot of prep during the holidays I bring a dish to a house I don’t make it there this would be easy to assemble once I arrived and pop in the oven, thanks! I agree…I’m all about it being simple and quick! This looks amazing! I just know my family would love it. This is a unique combination. I bet it tastes great! You are making me really hungry right about now. I have to have a recipe to cook so thanks for sharing the party planning site! And these look delicious (and easy)! These sound really good, my daughter would love making and eating them! I really love how EASY they are to make…my favorite! Those look so delicious! 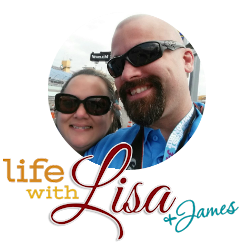 Great advice on handling a crazy busy season! This would make a great app to bring to a party. And, they are good looking, too. These sound so delicious! I love the combination of salty and sweet that you created here. Me too…sweet and salty just work great together. That looks to die for! I’d definitely be planting my seat near that tray! I love cheese and apples! I love all of these flavor but I would never think to put them together. I am going to try making these this week. Thanks for the idea! 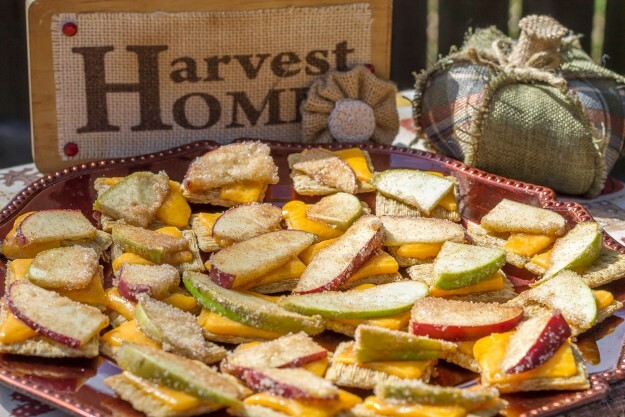 I’d have never thought about combining cheddar with apples, but what an ingenious idea! Looks good, too. That actually looks really good!!! !